All Bengali Current affairs pdf book available here. 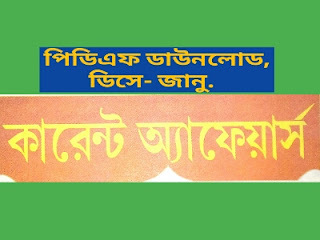 Are you looking for Bengali pdf book? Then, here is the best place for you. We update Bengali pdf book on our website weekly. Current Affairs is the most important topic of any kind of Competitive examination like ssc, wbssc, wbcs, psc, upsc, msc, fci, ibps, rail, police, etc. Most of the Bengal medium students search on internet Bengali language current affairs pdf book. But they could not found. We have solve this problem. Today GK Solve share Bengali Current Affairs pdf book Dec- Jan Edition download link. Details of pdf book and download link are given below. In this pdf you can get latest current affairs in bengali language. This is most important pdf for you. You can download easily this pdf book just one a click and free of cost. Hope, this post is really helpful to you.